I am so grateful for my photography family. As you can see, we have a wonderful time when we get together at events! 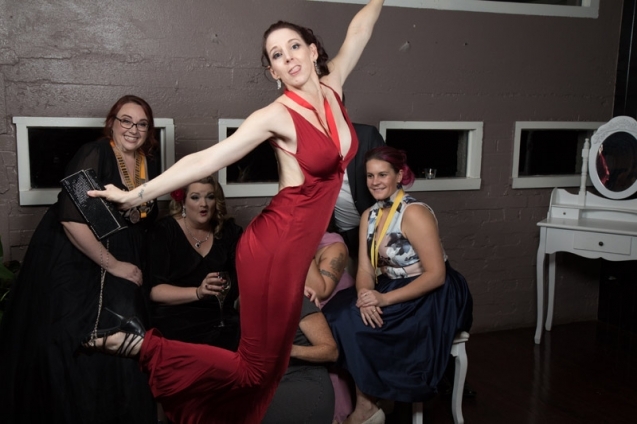 Here you see me performing a cracker photobomb at the recent 2017 AIPP Qld Professional Photography Awards. A scientist, yes, a lawyer, maybe, arty farty photographer type, definitely not! But Mother Nature had other plans and one day, 20 years ago, I became a mum. Almost immediately, I found myself with camera in hand a LOT. Pretty soon, I realised that I was born to be a photographer, and I soon came to realise just how much I loved colour, and light, and cute little faces smiling back at me! Putting them all together was the easy part, learning the techie stuff was not! I’ve realised over the years that Tanya Love was put here to tell stories. To express what others want to but can’t. I am quirky, fun, high energy, hyper-organised and somewhat neurotic, but I can be equally deep and melancholy and I’m not ashamed to admit it. Being an emotional person means that I connect very quickly with those I meet – and that can sometimes be confronting to people at first. It is also a wonderful gift, because it also means that in a very small amount of time, I can feel your story and know your family in an intimate way that allows me to help you share your light with the world. I am very authentic in my connections. I can’t be any other way. It is just who I am. I see you. I see your children. Kids immediately “get” this, and I think this is why they respond to me so well – because I genuinely love them. It is hard to label my my work as having a certain “style”, as it really is determined by my clients, their family dynamic and personalities and their story. I do, however, love colour, movement and all things quirky and “out there”! Vibrancy and contrast, and anything that is crazy and whimsical is right up my ally! I love to push creative boundaries and try things that may seem a bit crazy at first, and I can’t wait to meet you and see what awesome creations we can come up with together! ….and by the way, yes, “Tanya Love” *is* my real name! Dancing around my loungeroom, getting lost in the music. Going to the movies by myself, Gold Class, baby! Zarraffas Coffee -bring me a white chocolate mocha and I’ll run off into the sunset with you! Butterfly kisses. Wearing sarongs. Getting surprises. Curling up on the sofa and watching bad TV with somebody special. Fresh fruit smoothies (food of the gods!). Making a difference. The goosebumps I get when a child gazes at me through my lens. Telling stories – your stories. Writing – one of these days I will finish the novel I’ve been writing for the past 10 years! 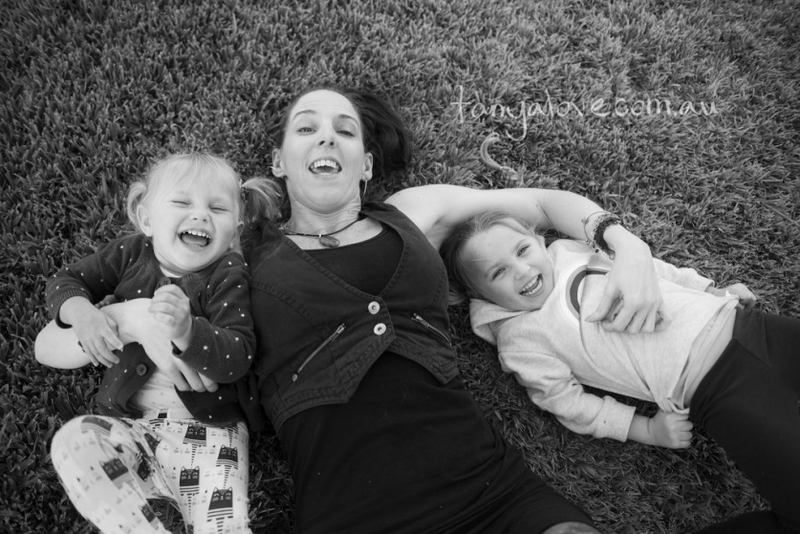 This is what happens when I give my client the camera and lay down on the grass with her kids! Sitting idle. Smokers. Cold weather (except when onesies are involved!). Being lonely. Unmade beds. Poor grammar. Bad spelling. Lying and manipulation. Laziness. Hypocrisy. Selfishness. Peas! (yes, those disgusting green and mushy, little round suckers that should never be found in pies!). Greed. Sleeping in and wasting the day. Missing my kids milestones. Running out of loo paper. Washing dishes by hand. Me with my youngest “babies”. Me with my biggest “baby”. I sleep little. I talk way too much (obviously!). I overthink EVERYTHING. I am addicted to writing lists. I am a perfectionist. I have terrible handwriting. I bite my nails. I am a *terrible* swimmer. I like using big words. I have a massive sweet tooth. I can type super fast. I’m a bit of a computer geek! Me demonstrating a pose to a client in studio – wearing my very glamorous socks of course! © 2019 Tanya Love Portrait – All rights reserved.